To have correct and well taken care of gardening tools is a great place to start any gardening endeavor. Here at Deer Isle Hostel and Homestead we only use hand tools (non-powered) in our gardens since we find that we can get the job done easier and more efficiently with a more correct impact on the soil and less impact on our bodies than we would with any machines. Broadfork This tall two handled fork usually comes with a 30 inch, 7 tines wide head. It’s pushed into the ground by stepping on the flat upper part of the head and the handles are used as leverages to lift the soil without turning or excessively breaking it up. The large area covered by the broad head makes it time efficient and lessen the impact of gardener since fewer lift/bend movements is needed to cover the same space. The tall handles allows for a more upright position than a standard digging fork and the leverage aids to lessen the human power needed. We use the broadfork as a way to “fluff” the soil up in the spring prior to planting but as the years go by and the quality of our soil improve we find the need for it to be less and less and that weoften can skip this step in the garden preparation. Slicing hoe I use the slicing hoe as my main way of weeding. I can stand up straight and lightly scritch-scratch between plants, in the paths or around the garden perimeter. The hoe head is a narrow blade about an inch wide and 6 inches broad. It cuts the weeds at the base and stirs up weed seeds to prevent them from germinating. Dibble Each year we plant a couple of thousands allium plants (garlic, leeks, onion) and a simple wooden dibble is a great way to create the holes where to put the seeds and seedlings in. We use wooden pegs left over after building our timber framed buildings. Any stick that is easy and smooth on the hand and can make a hole 4 inches deep and wide enough for a garlic clove will do. The dibble makes it to my favorite-tool list since it’s the ultimate low-tech solution for how we go about planting our biggest crops. 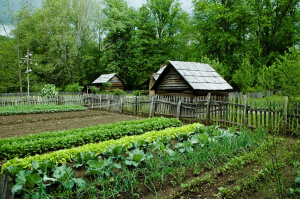 Read the full story via A Homesteaders 5 Favorite Gardening Tools – Organic Gardening – MOTHER EARTH NEWS.